Crossings: Newcastle Poetry Festival isn’t, at first glance, an obvious event for review by Bebop Spoken Here. 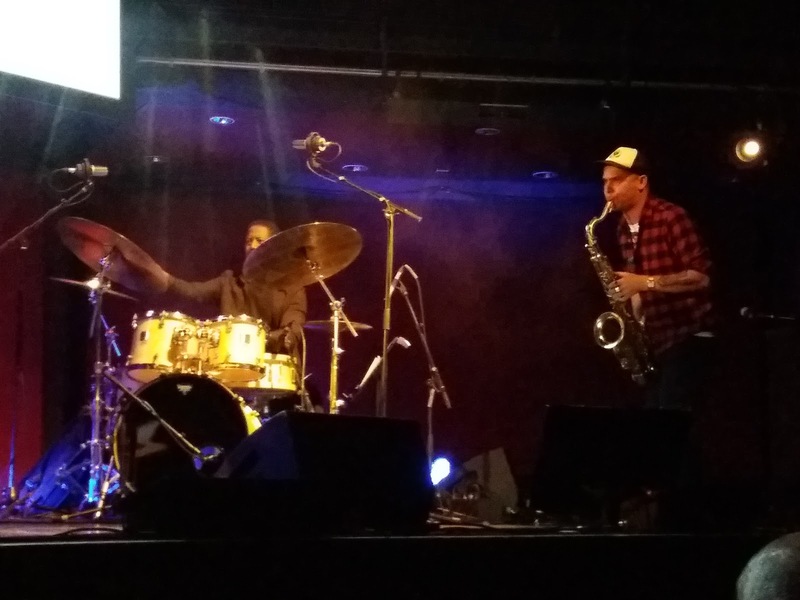 The participation of the much-hyped British saxophone and drums duo Binker and Moses flagged up the prospect of some ‘jazz’ content at this year’s Newcastle Poetry Festival. In the event, their input was if not minimal then certainly limited. 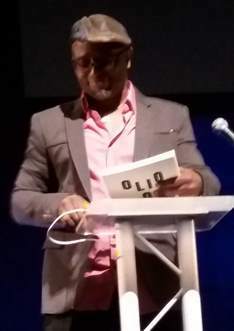 The Londoners were in Gateshead sharing a stage with New York-based poet Tyehimba Jess. The other half of this double bill – the second half of the evening – would feature poetry, singing and flamenco guitar. A moody, smoky, dry ice stage set welcomed Tyehimba Jess. 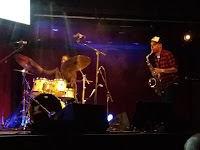 Standing tall, an assured character positioned behind an Apple Mac generation lectern, Jess read from his Pulitzer Prize-winning Olio collection with the tenor sax and drums element there to top and tail the American’s three-quarters of an hour performance in Sage Two. Examining and commenting upon nineteenth-century African American lives, Jess revealed the experience of slavery, emancipation and the ongoing struggle of those living today in difficult times. Tyehimba Jess offered an insight into his working methods. A precis will prove to be inadequate – Jess writes lines which can be read from the left to the mid-way point of the line, the eye darting to the line below, the remainder of the line (to the right of the mid-way point seemingly unconnected, to be read as a separate, stand-alone line). So far, so good. But there’s more, much more to Jess’ thinking. As he demonstrated, lines, half lines, can be read from any point on the page. Start from the last line and read up, skip a line, pick up at a random point in the text, amazingly, somehow it works. Copies of Olio were on sale outside Sage Two. Unsurprisingly all copies sold. And, as and when Binker Golding and Moses Boyd were pressed into action, they did the ‘jazz’ business. Following a short interval, poet Fernando Valverde walked onto stage alongside singer Juan Pinilla and – this would prove to be a real bonus – flamenco guitarist David Caro. 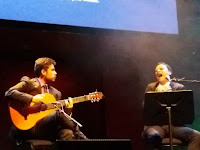 Valverde recited poems from Jugar con Fuego, a Latin Grammy-nominated collaborative work with Pinilla. As one would perhaps expect Valverde read in Spanish. A screen behind, high above projected an English translation of the text. At first, this was a welcome aide, yet, after a while, it didn’t matter that much, as Juan Pinilla’s impassioned singing stole the show. 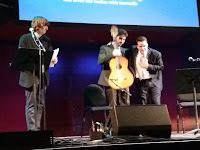 And speaking of stealing the show the brilliant flamenco guitarist David Caro just about stole the show himself, and, if he returned to Sage Gateshead to give a solo recital your Bebop Spoken Here reviewer would be first in the queue. An interesting and certainly very different evening’s entertainment at Sage Gateshead.